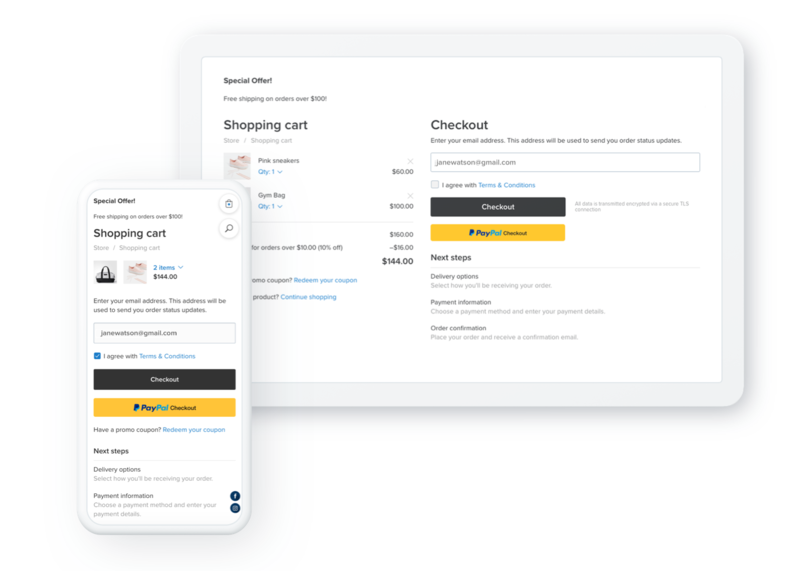 The last step of the next-generation Ecwid storefront is completed: meet the reimagined checkout page, the page where the money comes in. And man, it’s just awesome. A quick note: this update is automatically enabled for all new Ecwid stores. If you’ve been selling with Ecwid for a while, switch to the Next-gen Storefront in Settings → What’s New. Now you can capture customer emails even before they start the checkout. If they drop out in the middle, you still have their contact details and can recover them with an abandoned cart email or build a custom audience for retargeting. It’s much more effective than asking for email at the end of the checkout because you capture every bounced customer. There’s a psychological effect too: by entering an email address (which, by the way, is quite a simple thing to do), your customers become more committed to the order, and, since a part of the work is done, are more likely to complete it. Believe it or not, pictures can help improve your conversion rates. Instead of just listing your products, show the customer what they’re buying. While you may have an image or two of your products on your e-commerce shopping page, make sure that image shows up in the shopping cart. — Neil Patel. 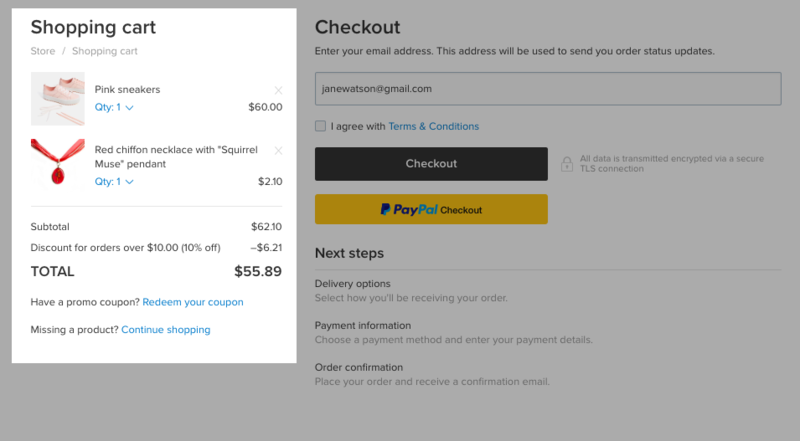 Moreover, since the cart page and the checkout are united on a single screen, the checkout process is one mouse click shorter (with the checkout optimization, every click counts!). It’s that simple: your customers go to their cart and can proceed to checkout right there. No extra clicks, less chance to bounce, less cart abandonment. A checkout that is too long and complicated is among the top three reasons for cart abandonment. 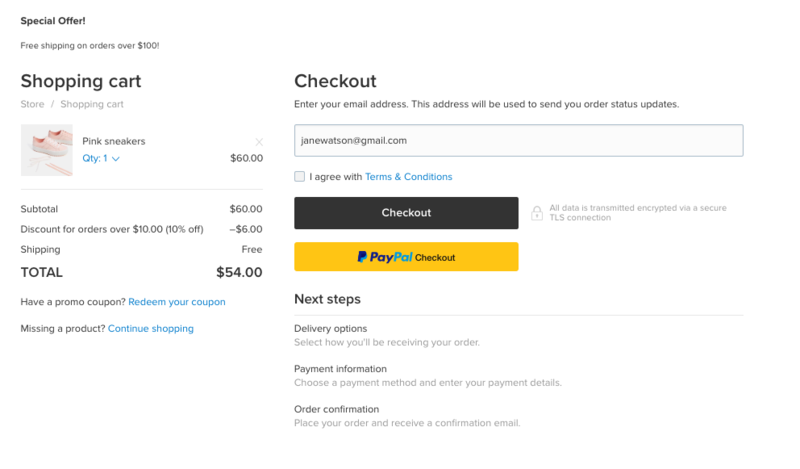 On the single and transparent checkout page, your customers don’t face a chain of steps that they didn’t know about when they started. It makes a better layout on different devices. A short summary of every completed step relieves customers from going through every step again and again to make sure everything’s right. Bold buttons help to distinguish in-store pickup and shipping quickly and simplify decision-making for your customer. The address form is separated from choosing a shipping method and comes first. That helps to calculate automatic shipping rates more accurately and makes the overall flow more straight and digestible. Autofill makes filling this form a breeze (if a customer has entered this shipping address in the browser before.) Additionally, Ecwid tracks the location via IP, and your customer gets the country and state filled for them when they check out. If your customer makes a repeat order, this form gets auto-filled too, and it’s possible to proceed to the next step right away. The new design of the credit card form looks much better — but that’s not the only improvement here. The process of filling out the credit card form has to be perfect for you to keep the customer and get paid. Ecwid checks the credit card number right away to make sure it’s valid to prevent customers from typos. After filling in the first four digits, your customer sees the credit card type, which adds confidence that he or she is using the right card. The credit card number is conveniently formatted (digits are grouped the same way they appear on the credit card for better visual perception). The form can be auto-filled with a single click if a customer has their credit card details saved in their browser. That saves your customers time and energy. No Cart Holder Name field: few people know that field is not mandatory, so it’s totally possible to skip it (just like Stripe does), speeding up filling the form and reducing traction. A visible shipping address on the map creates an additional wow-effect: your customer sees his or her location and expects to receive the order here. If the order is paid and has digital products, your customer can download them right on the order confirmation page. No need to open their inbox or go elsewhere. They see the file type too (music, images, PDF file, etc.) to bring in additional safety. The customer sees instructions on payment if the order needs to be paid. You can set up these instructions in your Control Panel → Payment for each payment method. With 52% percent of global web traffic originated from mobile devices, your smartphone and tablet shoppers are just as important as desktop visitors. 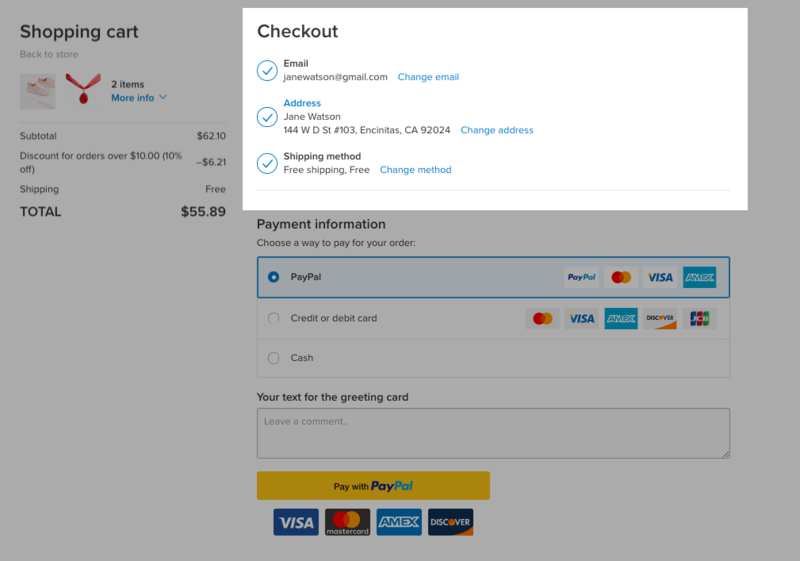 The new checkout page in Ecwid stores is comfortable to use no matter the screen size. If you want to add some checkout fields (for example, display a date picker or limit availability hours) or remove those you don’t need, the updated Extra Fields in the Ecwid API are now much more flexible. You might need help from a developer or simply refer to the Ecwid Customization Team. People love online shopping for its convenience. With the new Ecwid checkout page, your customers enjoy a hassle-free shopping experience and you get more sales without extra effort. 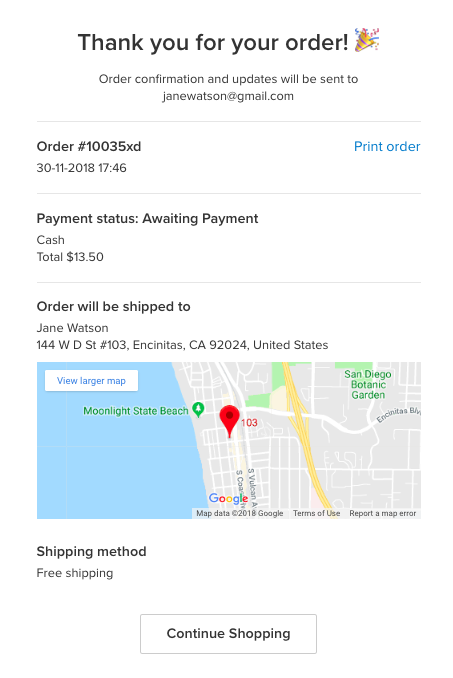 I’ve been collecting merchants’ feedback for a while to make the Ecwid checkout page perfect, and now I’m looking forward to hearing what you think. Feel free to drop me a line in the comments.